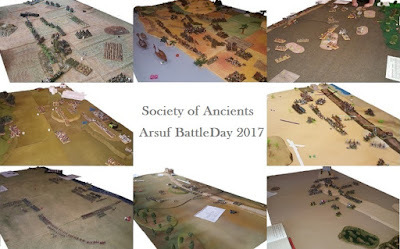 This year was Arsuf 1191 and the event was supported by eight different game/presenter combinations. 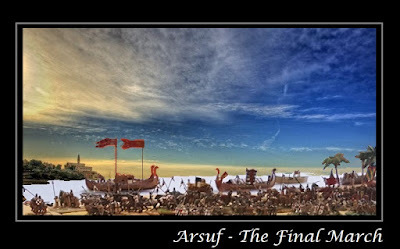 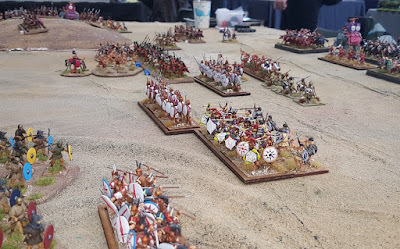 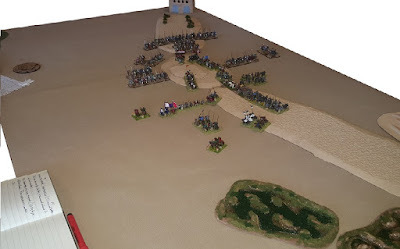 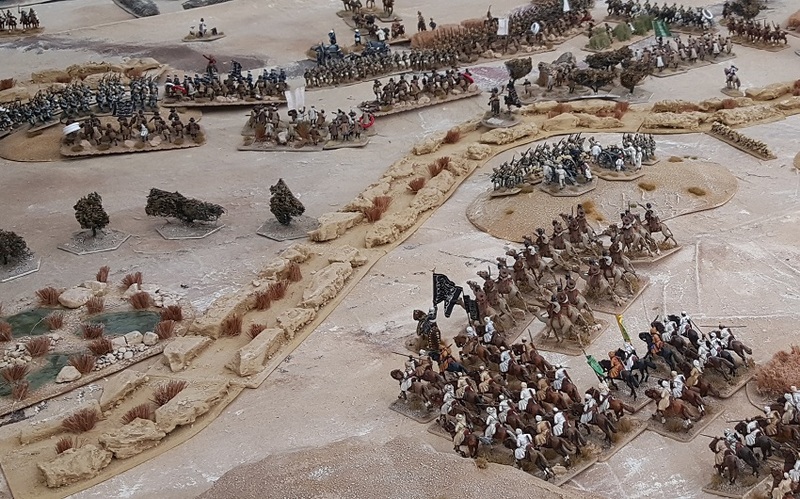 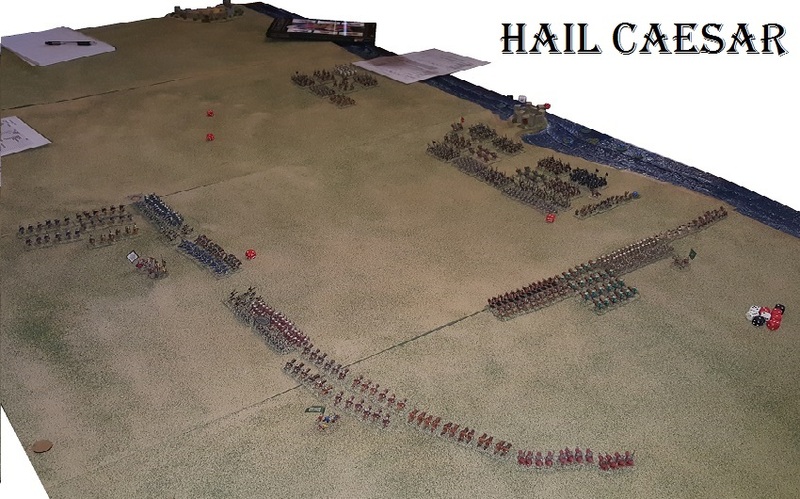 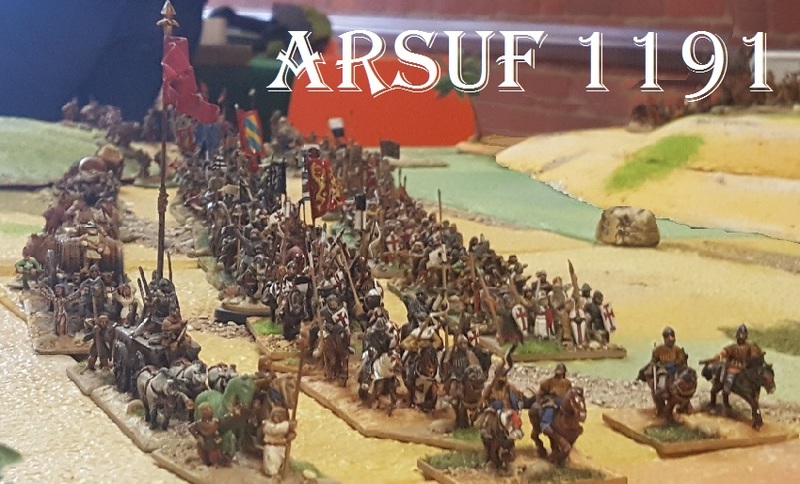 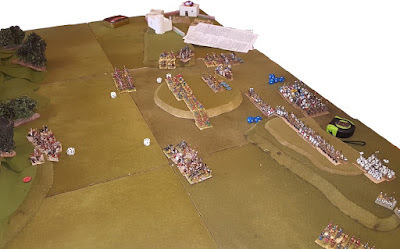 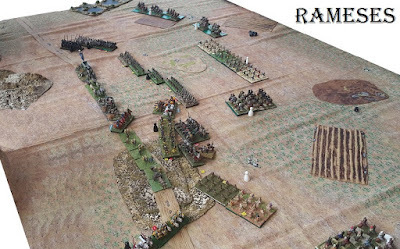 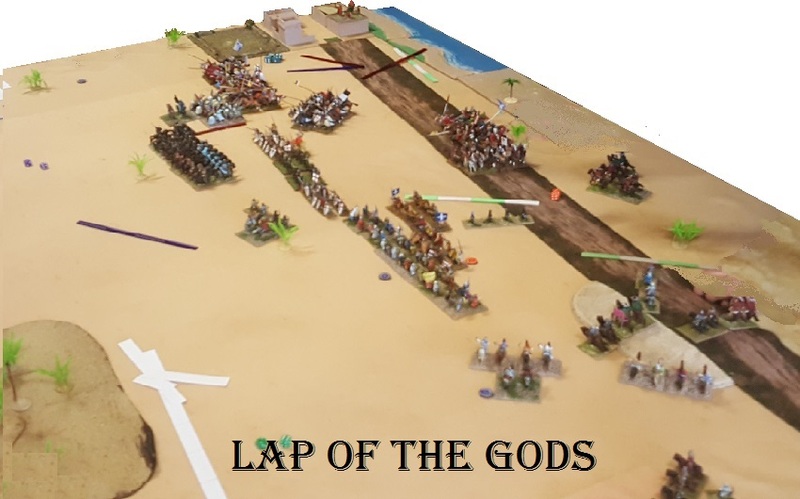 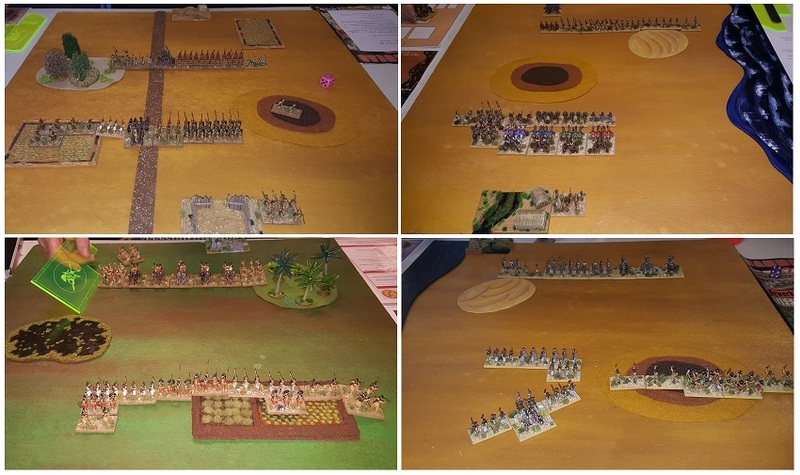 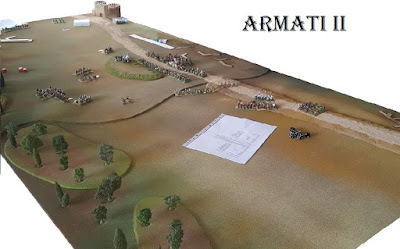 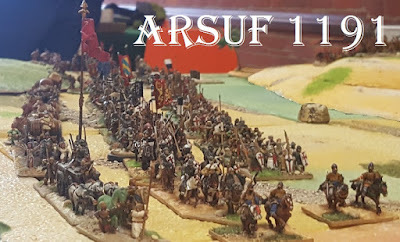 I had previously developed an Arsuf scenario for Armati but was very impressed with the reconfiguration I tried out as the show game at Claymore 2008 ... so, after a bit of tinkering, I decided to go with that. 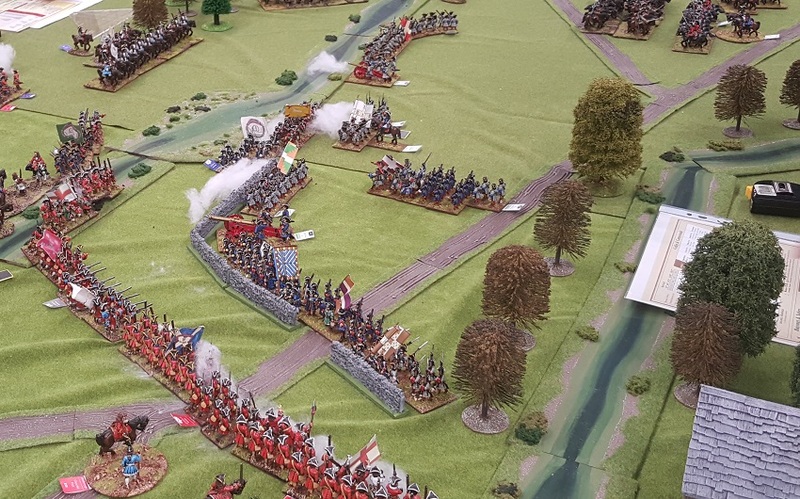 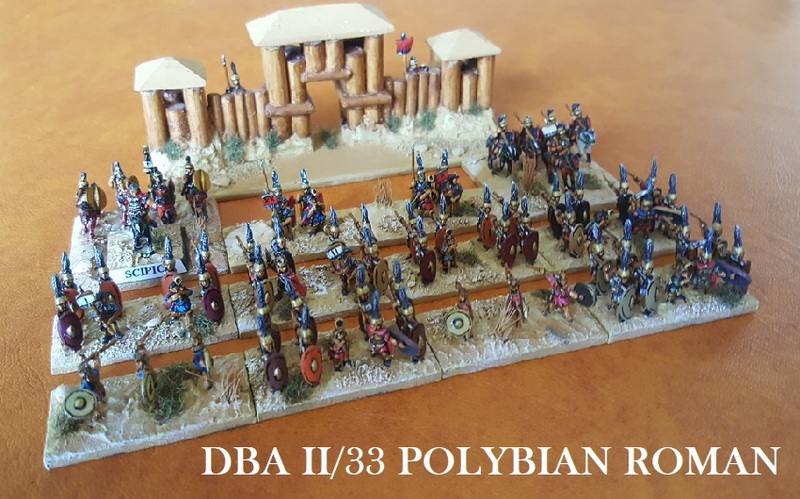 This was therefore a mature project and benefited from having all the components available - Richard's fleet, personality figures for all the commanders, bespoke baggage for the marching column etc. 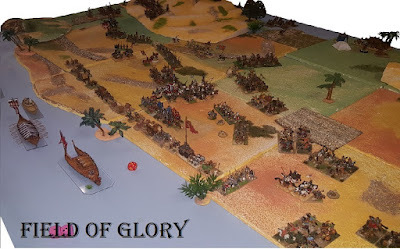 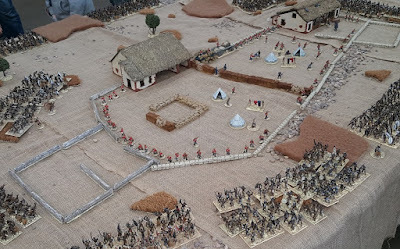 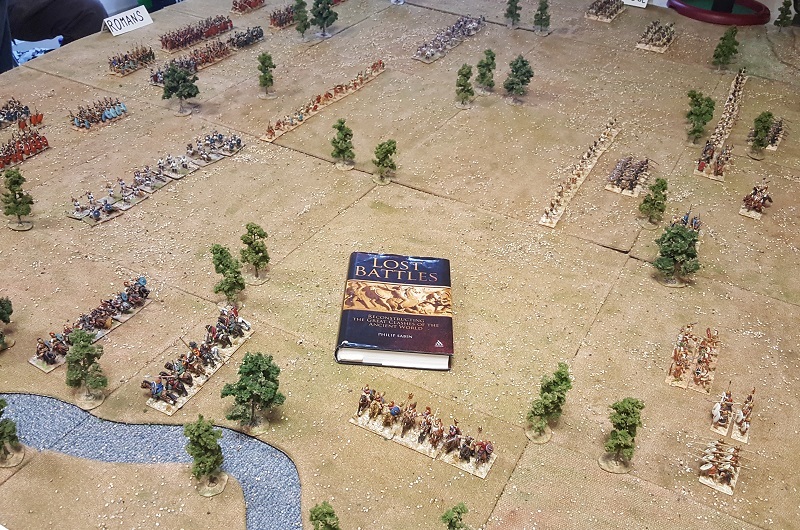 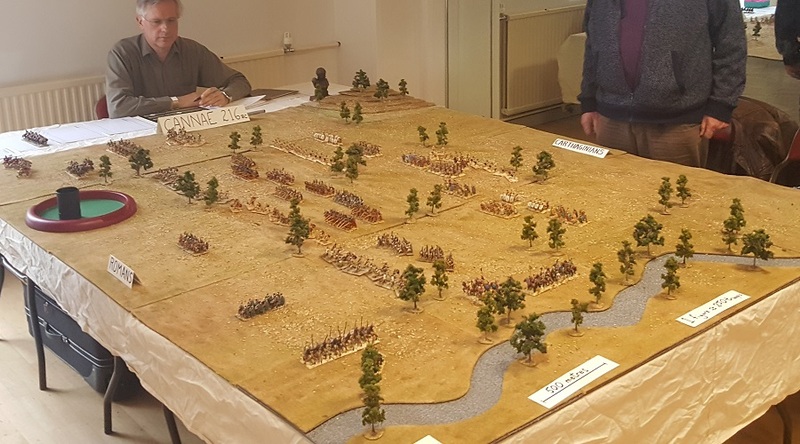 I had planned to 'workshop' the battle in episodes, trying bits of Impetus, FoG, ADLG maybe ... but as it turned out one of my volunteers wanted to try out Field of Glory (so that's where we started - it worked very well, so we decided as a group to stay with FoG and play it out). 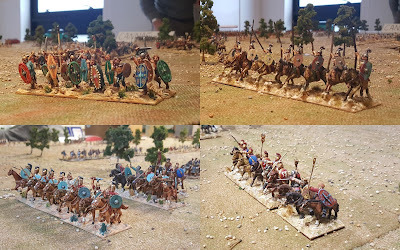 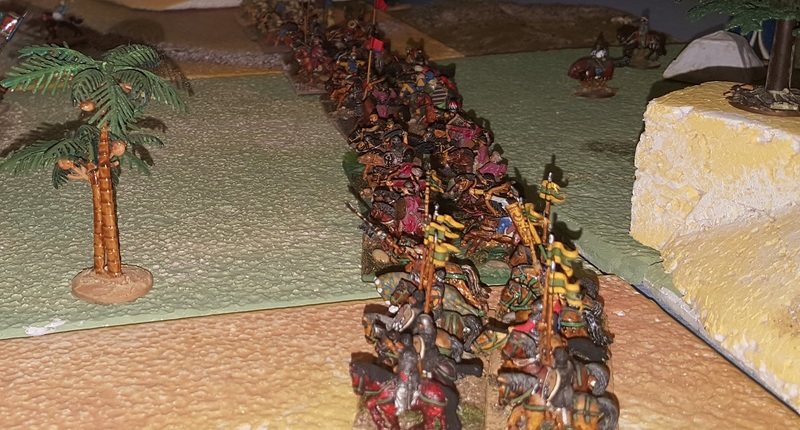 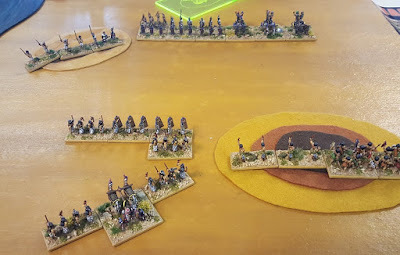 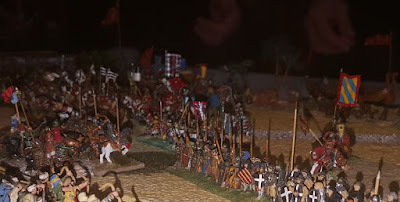 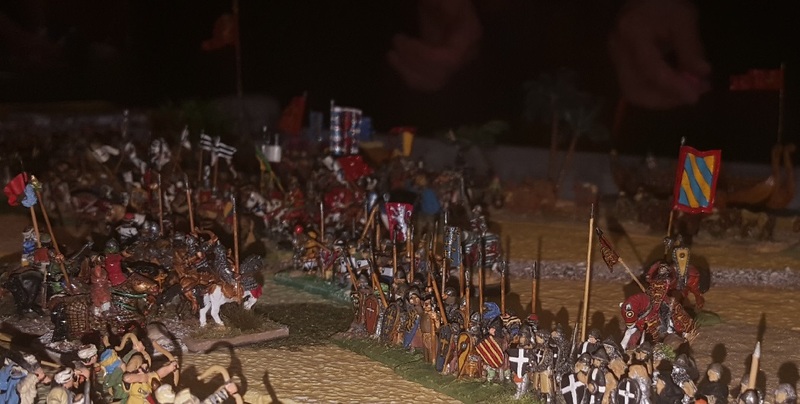 In our battle, the Crusader column was successfully stopped and bodies of knights were drawn away from the protection of the close formation ... gaps appeared in the lines and Mamluk cavalry were able to burst into the box, even as far as Richard's personal standard. 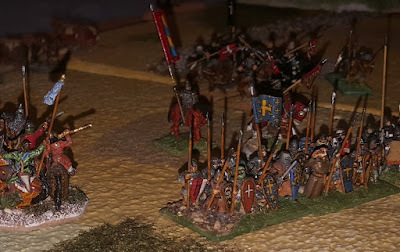 Luck was not with King Richard. Historically, it had been a different story ... though many Crusaders did drown in panic, charges from the line had been more controlled and had caught sufficient of the Saracens to disperse Saladin's army beyond immediate recovery and Richard was able to claim a victory. 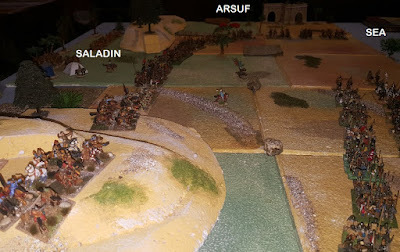 Operationally Arsuf was something of a stalemate: though claiming victory, Richard lacked the resources to strike at Jerusalem ... Saladin's field army was spent, however, and he could not exploit Richard's predicament. The two commanders were forced to come to terms. The first real show of the year in central England was always Alumwell and it still seems to feel like the start of the season even if it now follows a number of other events. 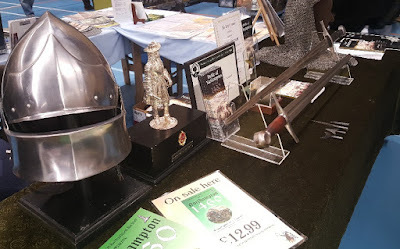 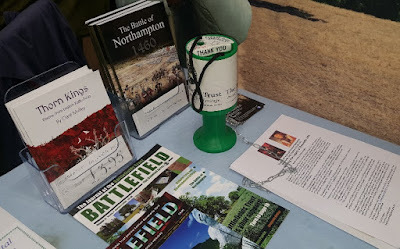 This is another combination show for us ... teamed up with the Battlefields Trust and Northampton Battlefield Society ... this time presenting NBS's newly published narrative game of the 1460 battle. 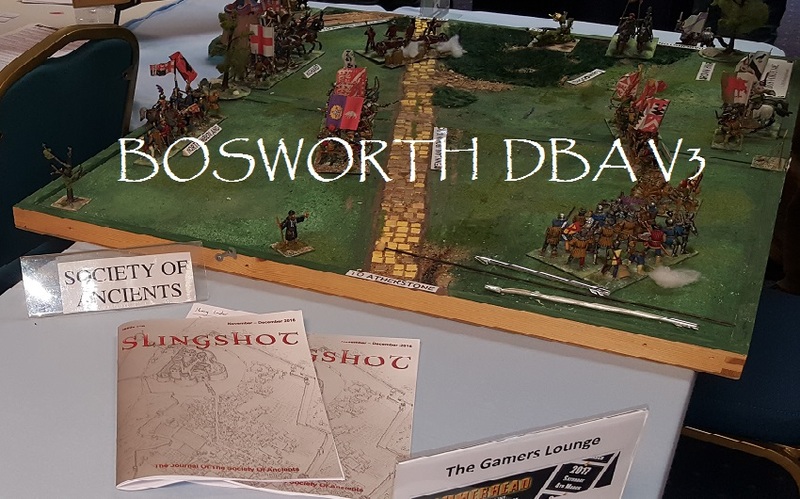 OK promotion done, but it will be reviewed in Slingshot and I'll give contact details in a follow up blog for those of you who want to get one. We played a number of games and everyone had a good time. 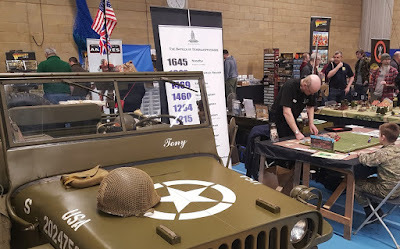 Graham was signing copies for autograph hunters. ... and if the show had a sub-plot, it was The Great War ... a number of splendid interpretations 100 years on from 1917. 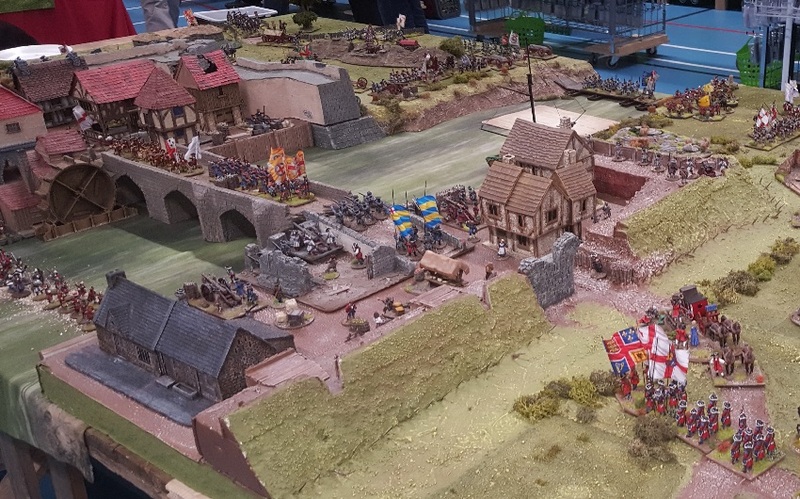 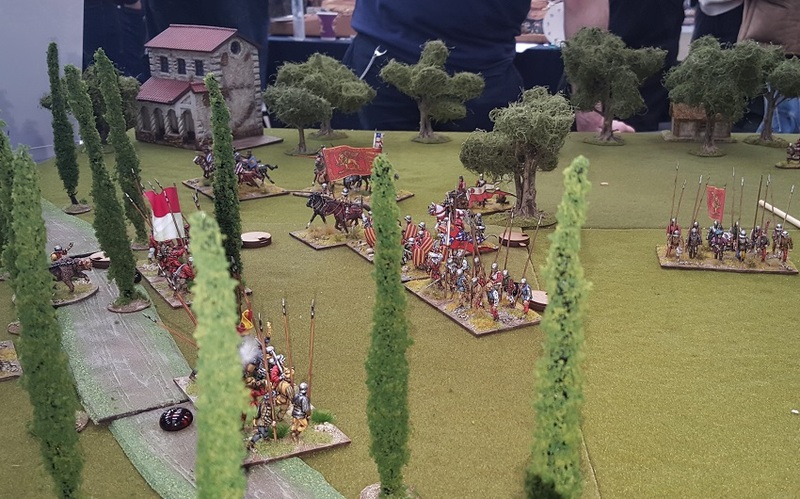 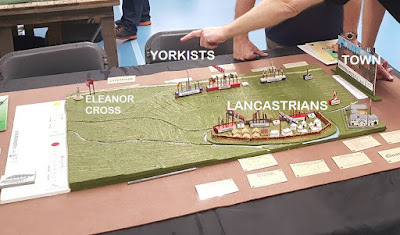 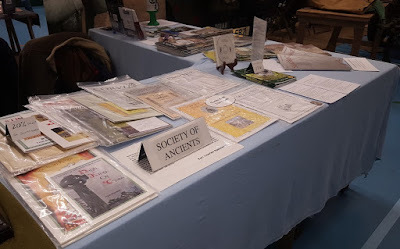 Meanwhile our participation game went on pretty much all day and introduced a few people to wargaming, a few more to the Wars of the Roses, and a fascinating range of plausible historical variants. A good show and a good day out. Thanks to the organisers and thanks everyone who joined. 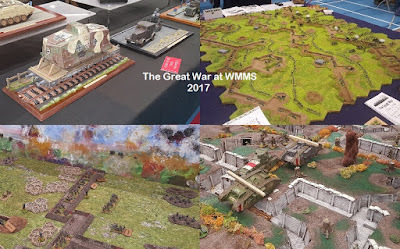 Make sure you don't miss Alumwell 2018. 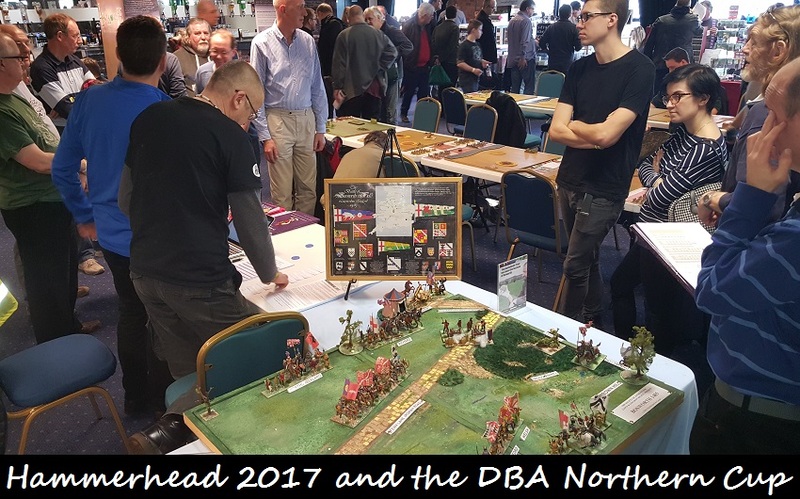 With no Triples this year, the Society sponsored DBA Northern Cup moved seamlessly over to middle England's 'up and coming' Hammerhead - and a very successful move it was. 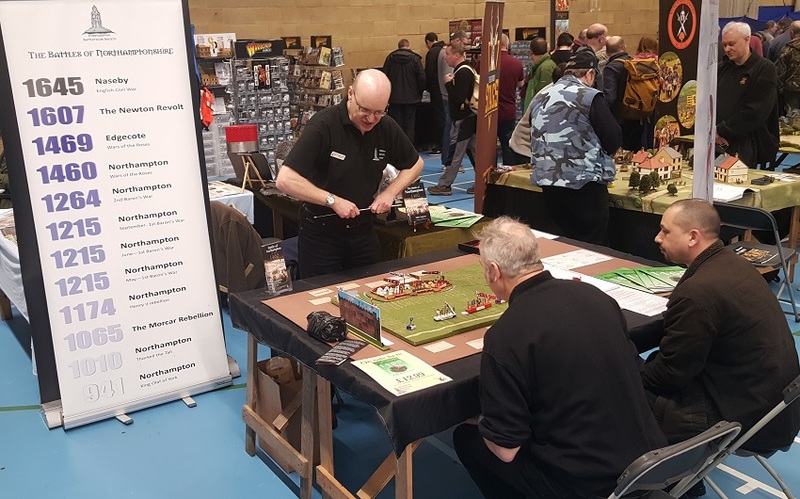 Hammerhead has established itself at Newark showground which now hosts the two Partizans as well. 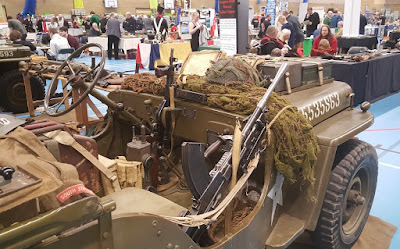 OK it lacks the charm of Kelham Hall but wins on parking and convenience. 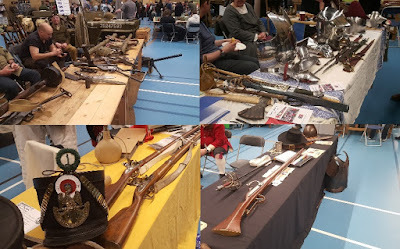 The main hall at the showground is, shall we say, spartan in its appeal - but the DBA event was in the gaming annex in a building across the way and had a number of advantages (shh or they'll all want some ... but lets just say 'carpet' and coffee without queueing ... ) .. 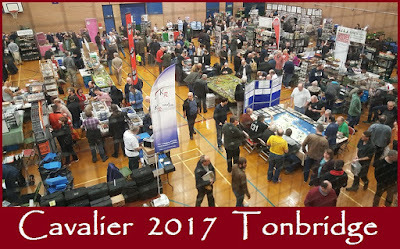 So ... a good venue, and, as always, a well managed event by Paul and Tony. 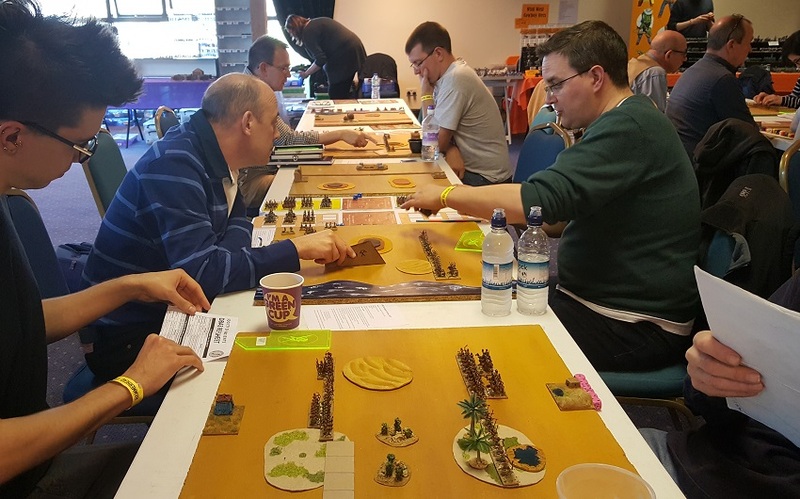 The format for the Northern Cup is preset armies and tables provided by the organisers ... attack/defend specified for the game but otherwise free deployment. 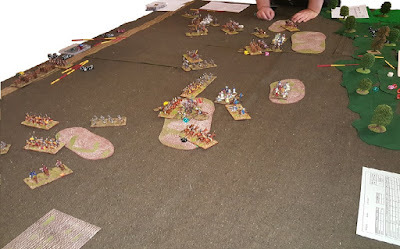 It works very well and is a great leveller. 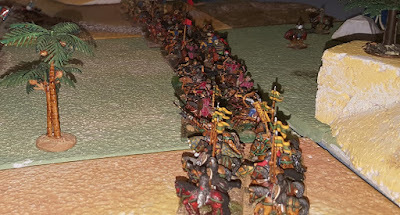 The armies were all from the early periods. 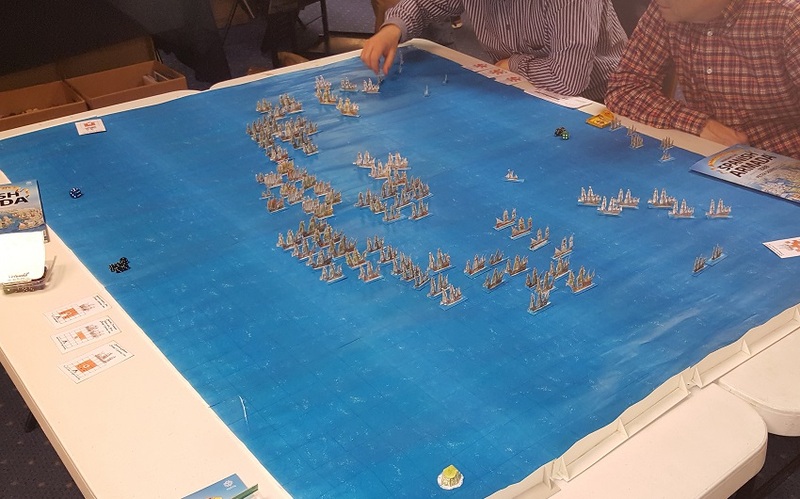 Also in our annex was this very appealing try-out game of the new Helion Armada game (simple Andy Callan rules and print-cut-and-glue paper ships). 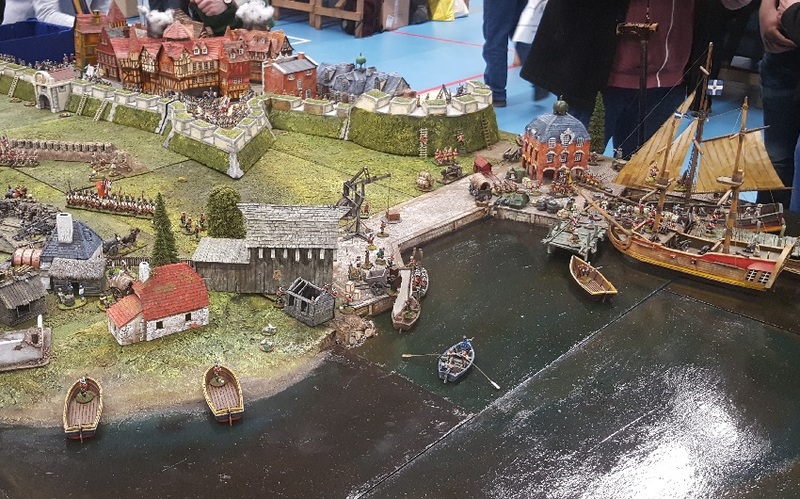 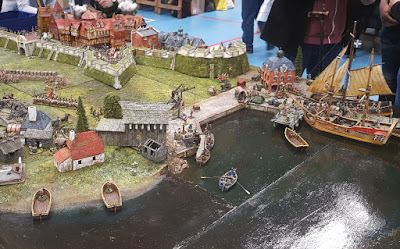 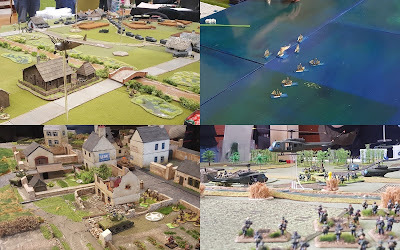 We were back for a couple more games after lunch (in which I fell from needing a miracle to no chance at all) but overall had a a great series of games and met some new players (as well as old friends) ... Indeed we had a nice mix of players including newcomers and youngsters (kudos to V3 of DBA for this encouraging trend and another full house). 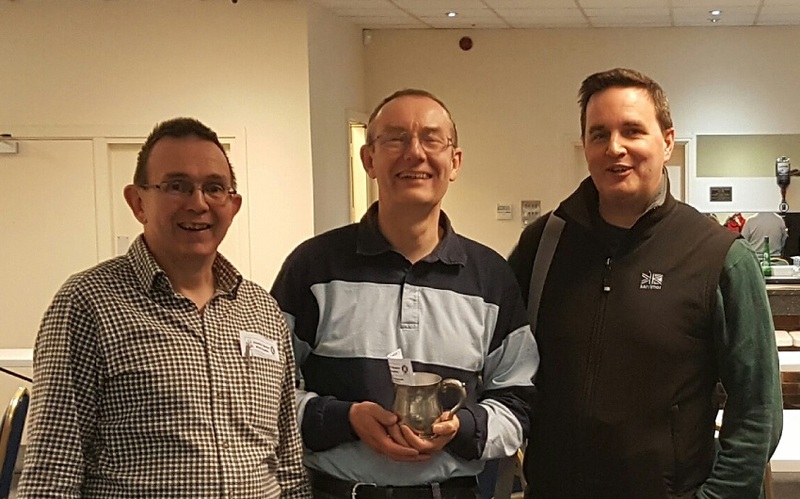 Hammerhead and the DBA Northern Cup - I'm already looking forward to the next one! 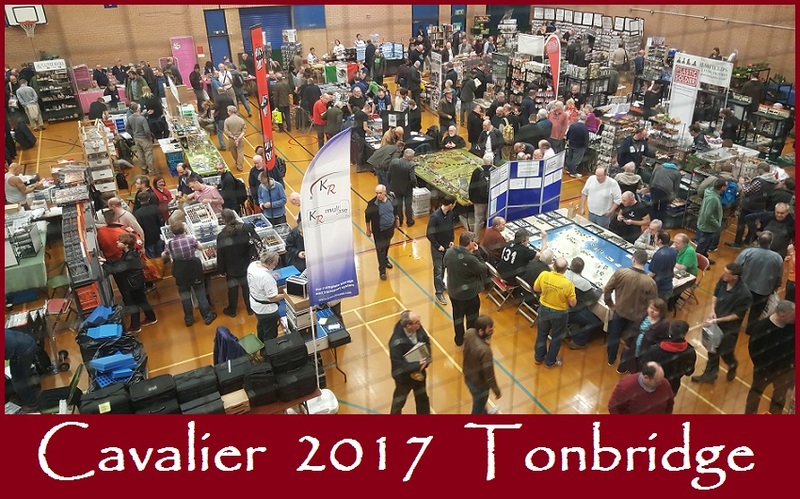 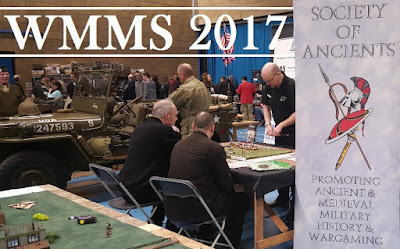 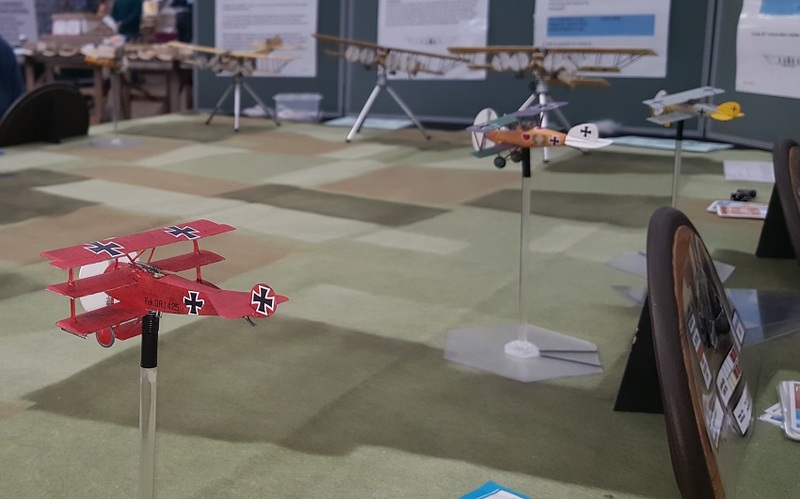 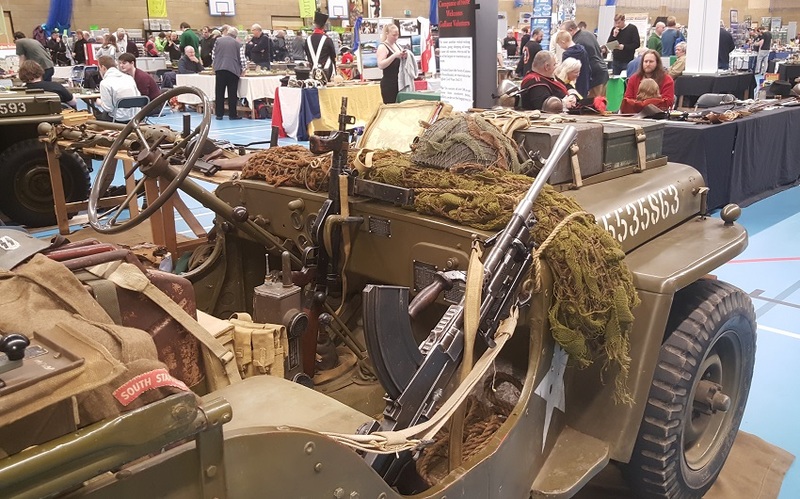 Elsewhere the show was well attended and featured an attractive mix of games ... WW2/Modern and Naval seemed to be the trends ... Perhaps something we will see during 2017? Look out for Hammerhead and WMMS in March and Salute in April.